I can’t begin to review this book without mentioning that beautiful cover. The image above does not do it justice at all. Those pale pink looking bits are in fact a beautiful shimmering foil. This book was a very welcome surprise when it arrived a couple of weeks ago and when I read the back, I knew it was a book I would enjoy. Susan Green is very, very set in her ways, most definitely on the autistic spectrum, When we meet her at the beginning of the book, her mother has just died provoking very little emotional response. She is also coming to terms with the surprising realisation that at the age of 45, she is pregnant for the first time – this was most definitely not in her plan! She enjoys living by herself in her small one bedroom flat but recognises that she will need somewhere bigger when the baby comes. The inheritance from the sale of her mother’s house will help with this. However, shockingly and unexpectedly, her mother had recently made a will granting her brother, Edward, lifetime rights to stay in the house. Convinced this cannot reflect her mother’s true wishes, she determines to challenge the will. I found it interesting that there is a quote from Graeme Simsion on the cover as Susan is a very similar character to his Don Tillman from The Rosie Project. Like Don, she has a very rigid, ordered way of life which suits her perfectly and little understanding of others. Also like Don, she comes up against circumstances beyond her control which make her uncomfortable but force her to adapt and change. I really liked how Susan gradually had to adapt yet remained true to herself. She was frustrating to read about at times but then I don’t have that understanding of what it is to be autistic and her behaviour and reactions were perfectly logical to her. She did make me laugh a lot too though. One example was when she had to go into her neighbour’s house to look after her toddler daughter in an emergency situation. She is quite horrified at the state of the house. “I don’t see why having children should be an excuse for letting your standards slip. I’d be surprised if my own did.” I’m sure that many mothers (and fathers) would have a wry smile at that. I think we all have plans and ideas of what parenthood might be like which change very soon after that little person arrives and turns your life upside down! I think that Susan is a character who becomes more endearing as you follow her through her pregnancy and her legal battles with her brother. I’d quite like to find out how Susan copes with motherhood so hoping there might be a sequel at some point. 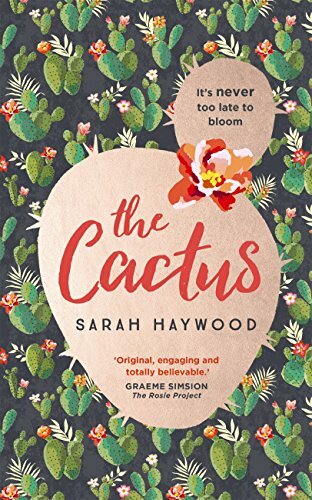 Susan is most certainly a quirky, memorable character and The Cactus is an assured debut from an author I’ll be watching out for in the future.